They’re back, and they want my tomatoes. I don’t give my tomatoes up easily, so these fruit flies have crossed a line. Time for another fruit fly trap. Many fruit-loving households have considered what to do with fruit flies. 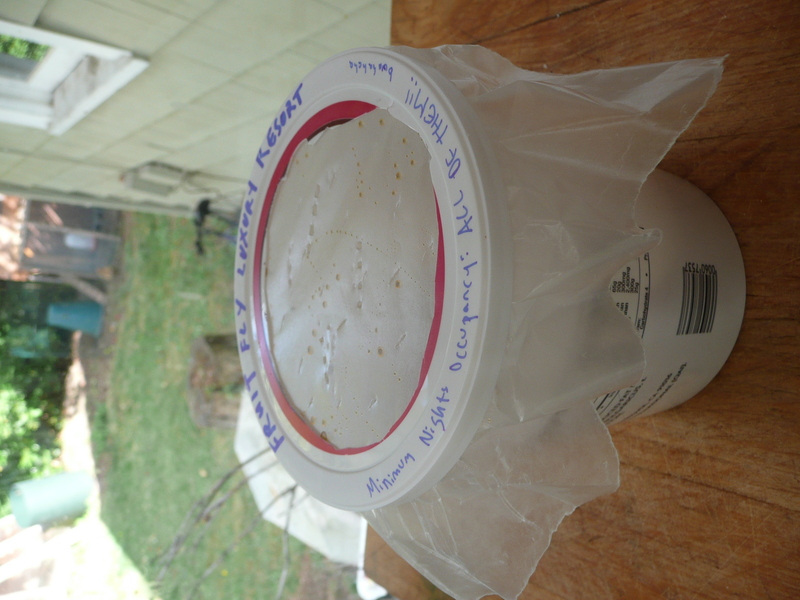 A former roommate and I joked about packaging them up for a friend of hers running drosophila experiments in the lab. But this trap is actually the best solution I know. I learned it from someone else, who learned it from someone else, and I’ve modified it over the years. 1. Take a plastic yogurt container, quart-size preferably. 2. Cut a circle out of most of the lid, so the lid still fits around the edges of the container but the top part of the lid is gone. 4. Get a piece of waxed paper (you can use plastic wrap too but I like waxed best because it’s stiffer, smooth, and biodegradable). 5. In a small area of the waxed paper, about the size of the opening of the yogurt container, punch small holes, with the ends of a fork, a pen, or a fine-pointed knife. They should be, you know, fruit-fly sized holes. 6. On the underside of the waxed paper, drizzle a bit of honey. You don’t need much. 7. Place the waxed paper with holes, honey side down, gently over the yogurt container. Use the cut lid-band to secure it in place. Place it wherever fruit flies are trying to hang out. Under a hanging basket of fruit, for instance. The fruit flies will go in, forcing their way through the holes toward those enticing smells, but won’t usually come back out again. It’s too hard to find their way out, too hard to get through holes pressed inward, and there’s not much motivation when the inside smells so deliciously like rotting fruit. 8. 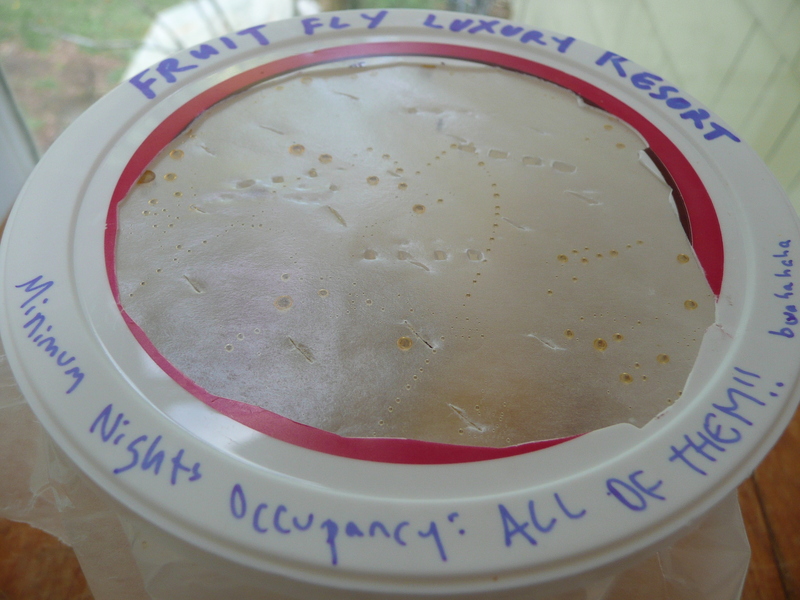 Every night or so, put the container in the freezer for a while to kill the fruit flies. Then, take it out and let the fruit thaw to do its work all over again. Enjoy your tomatoes! And don’t forget to vote in the Best of Western Washington food blog contest. Voting stays open until October 12th. Love it. I have been trying to figure out how to get ride of the fruit flies. Last year they invaded our cupboards. Thanks a bunch for the great idea!